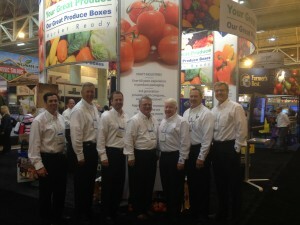 The Pratt team (l to r): Kevin Saunders, John Day, Steve Stevenson, Bob Herb, Mike Brown, Rodney Renfroe, Cliff Vilcheck. Pratt Industries Agricultural team made a very successful appearance at the annual Produce Marketing Association Fresh Summit trade show last month. The Fresh Summit is a weekend event held every October, this year in New Orleans, and is the largest single produce convention in the world. It brings in buyers from the biggest global retail chains and top management of produce growers, packers and shippers. This year more there more than 20,000 attendees. Pratt also hosted a cocktail party for its customers at the famous French Quarter restaurant, K-Paul’s Louisiana Kitchen. Chef Paul Prudhommes Magic Seasoning Blends is also a customer. “It was a great opportunity to strengthen our existing customer relationships and build new ones,” said Cliff. Next year’s trade show will be in Anaheim, California.